Materials: Overhead Projector (if available), as well as scissors, glue sticks, pencils and coloured construction paper for the class to use during the art activity. Ashley will start her presentation with an explanation of what an illustrator does, and how she came to be one. 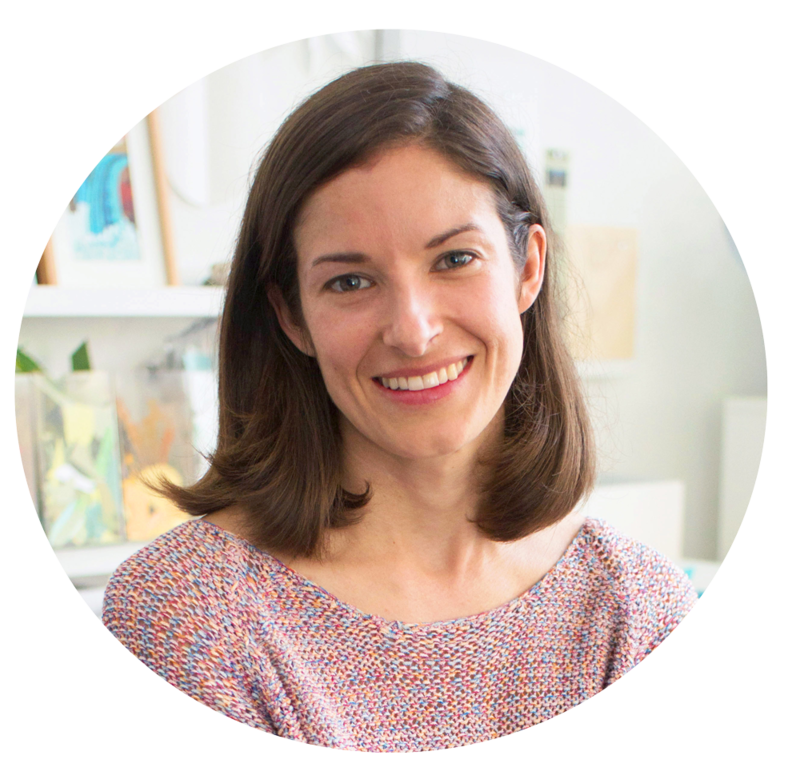 If a projector is available, she’ll accompany her talk with a slideshow of the drawings she made as a kid up to present-day photos of her illustrations, her studio and the tools and process she uses to make her art. Ashley will pass around samples of her original artwork for the kids to view up close. She’ll then choose one of her books as a jumping off point into a group art activity. After a fun, interactive paper collage demo, she’ll have the kids seated and ready to make their own paper collage creation. Her art activities involve little more than coloured sheets of paper, glue sticks, pencils and scissors, and yet the results are always surprising and inspiring. Part of the Math in Nature series, Shaping Up Summer introduces kids to math concepts such as geometry, symmetry and spatial sense with the help of scenarios inspired by the natural world. One of the spreads in Shaping Up Summer features a bird’s eye view of a pond abuzz with all kinds of plants and animals, asking the reader to identify which objects are symmetrical versus asymmetrical. Ashley will show the kids how to simplify animals/plants into basic shapes as part of her demo (for example: a circle, cut in half, makes a matching pair of dragonfly wings, where as a circle with a triangle cut out, makes an instant lily pad). A large piece of blue felt will be placed on the classroom floor, and it will be up to the students to fill it with all sorts of real or imagined paper-collaged pond-themed critters. At the end of the activity, the class will stand around their collective pond and point out which of the animals and plants appear symmetrical and which do not, and identify any other patterns they see. But most importantly, they’ll be encouraged to marvel at their overall creativity. Kyle is a baby three-toed sloth who reluctantly faces his fear of being alone as he makes his way down to the forest floor to do his “business”, without his mom’s help. In addition to the social-emotional theme of perseverance, this book also introduces kids to the concept of camouflage — Kyle meets all kinds of rainforest creatures he didn’t quite notice at first as he descends the tree. Ashley will ask the class to create their own paper-collaged rainforest plants and animals, keeping in mind this idea of camouflage. A large felt tree will act as a collective backdrop for the student’s creations to be placed upon. (Even the weariest of art students will be encouraged to cut out something as simple as leaves to add as their contribution.) At the end of the activity, the class will be encouraged to share their thoughts about the rainforest animals they’ve come up with, and what part of the tree they might be found living in and why. Ashley Barron is a multimedia artist who is best known for her cut-paper collage style work. Her award winning illustrations have appeared in magazines and children’s publications, as well as animations, advertising campaigns, clothing and window displays. Her playful depictions of flora and fauna combine elements of geometry, texture, pattern and a love for colour. To date, she’s illustrated ten children’s books, including the Math in Nature series, Kyle Goes Alone and Birthdays Around the World. Ashley grew up in the Oshawa/Whitby region of southern Ontario with her parents, younger sister and their many pet dogs and rabbits. Ashley’s love for books was ignited at an early age thanks to her mother, a preschool teacher, who kept an extensive collection of children’s literature in their spare bedroom. Although Ashley was very much an outdoorsy kid, she savored rainy indoor days, which allowed her the uninterrupted freedom to daydream, read and draw pictures to her heart’s content. Ashley’s love for art and literature followed her into adulthood. She graduated from the illustration program at Ontario Collage of Art & Design in 2007 and has been working as an illustrator ever since. In addition to her freelance work, Ashley enjoys teaching paper collage themed workshops for both adults and children at various galleries, schools, libraries and community centers across the GTA. In 2017, she was selected as IBBY Canada and Toronto Public Library’s Joanne Fitzgerald Illustrator in Residence. Ashley lives in Toronto with her partner, Kevin, and their three cats.